If you are Chosen (Jewish), there's a decent chance you indulge in delicious fried pastries like sufganiyot, or filled donuts, during Hanukkah. But if you hate yourself and your body, there's a decent chance you'll indulge in a SufganiKing -- a Whopper from Burger King Israel that is inexplicably topped with ketchup-filled donut buns. Normally, sufganiyot are filled with jelly, not ketchup. As some people tend to hate ketchup, this is probably for the best. As you can see, the arrows point out where the Whopper ends, and the donut begins. Hopefully this makes the concept clear to you. 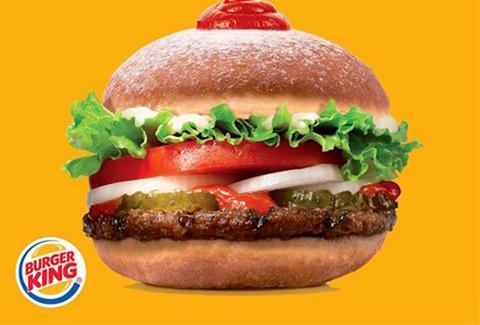 Introducing the "Hamburger" - swpgnyqyng bswpgnyyh especially for Hanukkah - proves that miracles still happen! So set up the -"omg" and start tagging partners in crime, because that doughnut. You do not want to miss. Which pretty much makes as much sense as it should.